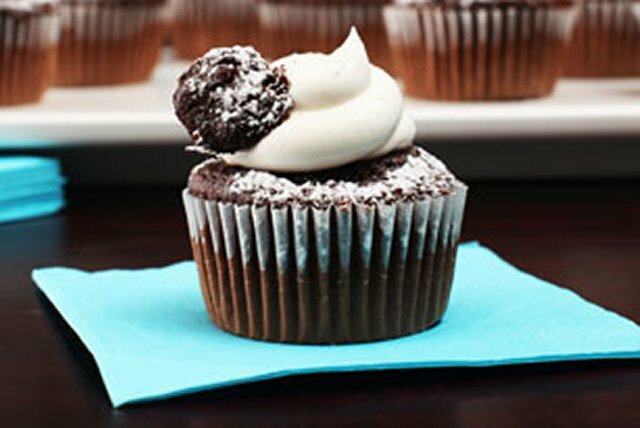 Make their mocha dreams come true with these dreamy cupcakes. Get out the coffee and chocolate cake mix and let's get started! Prepare cake batter as directed on package for 24 cupcakes, substituting coffee for the water and stirring 1/2 cup sour cream and cinnamon into batter before spooning into prepared muffin cups. Cool completely. Cut cone-shaped piece out of top of each cupcake; reserve for later use. Whisk 2 Tbsp. sugar and remaining sour cream in medium bowl until blended; stir in Cool Whip. Spoon into resealable plastic bag. Cut corner off one bottom corner of bag; use to pipe Cool Whip mixture into holes in tops of cupcakes. Top with reserved cake pieces, pressing gently into Cool Whip mixture to secure. Sprinkle with remaining sugar just before serving. The Cool Whip mixture can be prepared in advance. Refrigerate up to 2 days. Stir before using as directed.